Yemen was the home of the Sabaeans (biblical Sheba), a trading state that flourished for over a thousand years and probably also included parts of modern-day Ethiopia and Eritrea. In 275 AD, the region came under the rule of the later Jewish-influenced Himyarite Kingdom. Christianity arrived in the fourth century, whereas Judaism and local paganism were already established. Islam spread quickly in the seventh century and Yemenite troops were crucial in the expansion of the early Islamic conquests. Administration of Yemen has long been notoriously difficult. Several dynasties emerged from the ninth to 16th centuries, the Rasulid dynasty being the strongest and most prosperous. The country was divided between the Ottoman and British empires in the early twentieth century. The Zaydi Mutawakkilite Kingdom of Yemen was established after World War I in North Yemen before the creation of the Yemen Arab Republic in 1962. South Yemen remained a British protectorate known as the Aden Protectorate until 1967. The two Yemeni states united to form the modern republic of Yemen in 1990. 950 BC - 115 BC Sabean Kingdom (Kingdom of Sheba). 525 - 575 Part of Axum (Ethiopia). 575 - 632 Part of Sassainian (Persian) Empire. 861 - 997 Ya'furid dynasty rule over Sana'a. 1022 - 1159 Najahid dynasty rule over Zabid. 1047 - 1138 Sulayhid dynasty rules over Yemen. 1173 - 1229 Ayyubids of Egypt controls South Yemen and Aden. 1229 Rasulid dynasty breaks away from Ayyubid rule. 1229 - 1442 Rasulid dynasty rule over Yemen. 1454 - 1517 Tahirid dynasty rule over Yemen. 1511 - 1517 Sana'a occupied by the Egyptian Mameluke Sultanate. 1517 - 1636 Part of the Ottoman Empire (conquest of Sana'a 23 Aug 1547). 1517 Ottoman Eyalet of Yemen established. 21 Aug 1567 - 26 Jul 1569 Anti-Ottoman rebellion in Sana'a. Sep 1597 Qasimi State established, called Yemen from c.1905. 1849 Ottoman Eyalet of Yemen re-established. 25 Apr 1872 Ottomans re-occupy Sana'a, Vilayet of Yemen established. 23 Nov 1876 - Apr 1905 Annexed to Ottoman Empire. Sep 1904 Anti-Ottoman revolt begins. Apr 1905 - Sep 1905 Yemenis occupy Sana'a. 30 Oct 1918 Independence from Ottoman (Mutawakkilite Kingdom of Yemen). 23 Jan 1919 Last Ottoman forces in northern Yemen surrender. 24 Jul 1923 Turkey sovereignty over Yemen ended by the Treaty of Lausanne. 1926 Nejd annexes Najran (not recognized by Yemen). 02 Sep 1926 Mutawakkilite Kingdom of Yemen internationally recognized. (Egypt [and to 28 Sep 1961 Syria]) as United Arab States. 06 Oct 1972 - 22 May 1990 Kamaran Islands Occupied by North Yemen (Sana'a). 22 May 1990 Unification with Yemen (Aden) as Republic of Yemen. This is a list of rulers of Saba and Himyar. It is based on the unabridged book of Dr. Jawad Ali "The history of Arab nations before Islam" which derives and reconstructs the lineage of the kings of Saba and Himyar based on inscriptions and other historiographical evidence. This book is in Arabic and has been translated to Persian. In the Qur'an, the title "Tubba" is used to refer to these rulers. Reference: Brannon M. Wheeler (2002). Prophets in the Quran: An Introduction to the Quran and Muslim Exegesis. Continuum International Publishing Group. p. 166. ISBN 0-8264-4956-5. Kingdom of Saba (Sheba) Version 1 - sources for early Yemeni states disagree to a large extent, and cannot be reconciled with any clarity. Here, therefore, is one version for Saba. Note: The two names Sheba (spelled in Hebrew with shin) and Seba (spelled with samekh) are mentioned several times in the Bible with different genealogy. For instance, in the Generations of Noah Seba, along with Dedan, is listed as a descendant of Noah's son Ham (as sons of Raamah, son of Cush). Later on in Genesis, Sheba and Dedan are listed as names of sons of Jokshan, son of Abraham. Another Sheba is listed in the Table of Nations as a son of Joktan. Another descendant of Noah's son Shem. There are several possible reasons for this confusion. One theory is that the Sabaean established many colonies to control the trade routes and the variety of their caravan stations confused the ancient Israelites, as their ethnology was based on geographical and political grounds and not necessarily racial. Another theory suggests that the Sabaeans hailed from the southern Levant and established their kingdom on the ruins of the Minaeans. It remains a theory however and cannot be confirmed. The most famous claim to fame for the Biblical land of Sheba was the story of the Queen of Sheba, who travelled to Jerusalem to question King Solomon, arriving in a large caravan with precious stones, spices and gold (1 Kings 10). The apocryphal Christian Arabic text Kitāb al-Magall ("Book of the Rolls"), considered part of Clementine literature) and the Syriac Cave of Treasures, mention a tradition that after being founded by the children of Saba (son of Joktan), there was a succession of sixty female rulers up until the time of Solomon. Josephus, in his Antiquities of the Jews, describes a place called Saba as a walled, royal city of Ethiopia that Cambyses II renamed as Meroë. He writes that "it was both encompassed by the Nile quite round, and the other rivers, Astapus and Astaboras", offering protection from both foreign armies and river floods. According to Josephus it was the conquering of Saba that brought great fame to a young Egyptian prince, simultaneously exposing his personal background as a slave child named Moses. Kingdom of Saba (Sheba) Version 2 - sources for early Yemeni states disagree to a large extent, and cannot be reconciled with any clarity. Here, therefore, is another version for Saba. Mostly parts to Himyar thereafter, but see also Gurat and Marib. These two nations were the remnants of Sheba and both fell to Himyar in the 3rd Century. GURAT - A Yemeni Kingdom; a relict of Saba remaining after the Himyarite conquest of the 1st/2nd century CE. MARIB - A Yemeni Kingdom; a relict of old Saba after the conquest of central Yemen by Himyar. In the Quran, Sheba is mentioned in surat an-Naml in a section that speaks of the visit of the Queen of Sheba to Solomon. The Quran mentions this ancient community along with other communities that were destroyed by God. Bilqis reclining in a garden, Persian miniature (ca. 1595), tinted drawing on paper Illustration in a Hafez Frontispiece Depicting Queen Sheba, Walters manuscript W.631, around 1539 In the Quran, the story essentially follows the Bible and other Jewish sources. Solomon commanded the Queen of Sheba to come to him as a subject, whereupon she appeared before him (an-Naml, 30–31, 45). Before the queen had arrived, Solomon had moved her throne to his place with the help of a jinn. She recognized the throne, which had been disguised, and finally accepted the faith of Solomon. Muslim commentators such as al-Tabari, al-Zamakhshari, al-Baydawi supplement the story at various points. The Queen's name is given as Bilqis, probably derived from Greek παλλακίς or the Hebraised pilegesh, "concubine". According to some he then married the Queen, while other traditions assert that he gave her in marriage to a tubba of Hamdan. According to the Islamic tradition as represented by al-Hamdani, the queen of Sheba was the daughter of Ilsharah Yahdib, the Himyarite king of Najran. Muslim scholars, including Ibn Kathir, related that the people of Sheba were Arabs from South Arabia. In Ethiopian tradition, the Sheba (Saba in Ethiopic) who was Joktan's son is considered their primary ancestor, while Sabtah and Sabtechah, sons of Cush, are considered the ancestors of the Cushites. Traditional Yemenite genealogies also mention Saba, son of Qahtan; however, they claim Sabaean descent not from him, but from yet another Saba not mentioned in scripture who was said to be a grandson of Ya'rub and a great-grandson of Qahtan. In the medieval Ethiopian Kebra Nagast, Sheba was located in Ethiopia. Some scholars therefore point to a region in the northern Tigray Region and Eritrea, which was once called Saba (later called Meroë), as a possible link with the biblical Sheba. Donald N. Levine linka Sheba with Shewa (the province where modern Addis Ababa is located) in Ethiopia. The location of the kingdom mentioned in the Bible was long disputed. Israel Finkelstein and Neil Asher Silberman suggest that the kingdom was located in southern Arabia. Owing to the connection with the Queen of Sheba, the location has become closely linked with national prestige, and various royal houses claimed descent from the Queen of Sheba and Solomon. According to the medieval Ethiopian work Kebra Nagast, Sheba was located in Ethiopia. Ruins in many other countries, including Sudan, Egypt, Ethiopia and Iran have been credited as being Sheba, but with only minimal evidence. Even a massive earthen monument of the Yoruba people in Nigeria known as Sungbo's Eredo is held by Yoruba oral tradition to have been built in honour of the powerful queen Oloye Bilikisu Sungbo, who is often equated with Queen Bilqis. (Arabic: مملكة حِمْيَر‎‎, Mamlakat Ḥimyar) (Hebrew: ממלכת חִמְיָר‎‎) (Flourished 110 BCE–520s CE), historically referred to as the Homerite Kingdom by the Greeks and the Romans, was a kingdom in ancient Yemen. Established in 110 BCE, it took as its capital the ancient city of Zafar, to be followed at the beginning of the 4th century by what is the modern-day city of Sana'a. The kingdom conquered neighbouring Saba' (Sheba) in c. 25 BCE (for the first time), Qataban in c. 200 CE, and Haḍramaut c. 300 CE. Its political fortunes relative to Saba' changed frequently until it finally conquered the Sabaean Kingdom around 280. Himyar then endured until it finally fell to invaders from the Kingdom of Aksum (Ethiopia) in 525. As with Saba list above, Himyar ruler list is inconsistent with other sources, therefore they are two versions show below. Zu-Raidan - An earlier core of Himyar. Il-Adhdh Naufan Yuhasdiq...c. 245- ? Ab-Karib is spoken of in traditional lore as having been the first Himyarid King to accept Judaism. Certainly Masruq, below (early 6th century) was Jewish, and there was formerly a large Yemenite Jewish population. Sharah-bil Ya'fur......................................c. 433 - ? Qahtan ibn 'Aber...................................1556 BCE - ? As a case in point, "Qahtan" also appears in early Hebrew genealogies, as Joktan ben Ever (Eber, Heber), a son of the eponymous ancestor of the Habiru (Hebrew) nomadic peoples. Possibly the Jerah ben Joktan referred to in the genealogies referenced in the note just above. Mastuq Dhu-Nuwas was born, or a convert, to Judaism, which resulted in the invasion of Yemen by Ethiopian Christians, with the active connivance of the Byzantine Empire. Abrahah was the Ethiopian commander in South Asia before assuming control of the client state and proclaining himself King of South Arabia. Khalid ibn Sa'id...................................632 - ? In 819 the Caliph al-Ma'mun appointed Muhammad ibn Ziyad as governor of Yemen. Ironically, ibn Ziyad was one of the last remaining kinsmen of the Umayyad Caliphs in the East, the rest having largely been exterminated in the middle of the previous century. (This was but one of al-Ma'mun's odd appointments; the Caliph had at one point considered Ali al-Rida, a Shi'ite, as his successor, sparing a revolution). Ibn Ziyad's authority soon crumbled, and Yemen was lost to the Caliphate. Ibn Ziyad and his descendents continued to rule at Zabid. Itakh was a Khazar ghulam in Abbasid service who was made governor of Yemen by the Caliph in 839. His position was largely titular as Yemen had by this time disintigrated into a collection of feuding states, only some of whom acknowledged even nominal allegiance to the Caliphate. An era of fragmentation, when several local states formed in various parts of southwestern Arabia, as well as the extension of Fatamid and Carmathian influence into the region. Aden, Dhu Jibla, Najran, San'a and Zabid. Unity was re-imposed upon Yemen with the invasion of the Ayyubids. Muhammad ibn Ziyad had been sent to Yemen as the appointed Caliphate governor of all Yemen - his authority rapidly vanished in the face of widespread turmoil and separatist movements, and so he contented himself with establishing his own independent dynasty at Zabid. Zabid is a city-state in southern Yemen, periodically exercising control over the Hadramaut region and the coastal lowlands. Ziyadid were under Caliphate control from c.630 to 1018. Ishaq ibn Ibrahim Abu'l Jaysh...........................911 - 981 ? Though the Ziyadids continued to rule for some time as puppets, true power passed to their black slave ministers, one of whom founded the Najahid dynasty. An interior city in the far south of the Arabian Peninsula, currently the capital of Yemen. From the 9th century, it has been a center of the Zayidi Shi'ite sect. Full name: al-Hadi ila al-Haqq wa al-Mukhtar li-dín Allah Yahya ibn al-Husayn ibn al-Qasim. Full name: al-Murtada li-dín Allah abu al-Qasim Muhammad ibn Yahya. Full name: al-Mansur-bi Allah abu al-Husayn al-Qasim ibn Ali al-Ayyani. Abu'l Fath ibn al-Husayn, al-Daylami al-Nasr......1045 - 1062 ? SA#1068 Silver Sudaysi (1/6 Dirham). Year: AH 301-322 (913 - 934). Weight: 0.27 g. Metal: Silver. Diameter: 14.50 mm. Edge: Plain. Alignment: Rotated. Mint: Sa'dah. Obverse: Islamic Kalima written within the center circle. Reverse: King's name and title in the center circle. Mintage: N/A. Mintage Years: AH 301-322 (913-934). 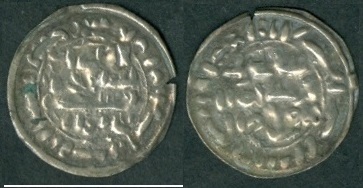 Ruler: Ahmad ibn Yahya al-Nasr. Note: Common type. Sulayhid were mainly at Dhu Jibla, a locale in central Yemen, the main base for a tribal confederacy, Ismai'li Shi'ites and adherents of the Fatimid claimants to the Caliphate. They were under Caliphate (c. 625-c. 910) and then Fatamid sphere of influence (c. 910-1138). He ruled Dhu Jibla and Aden 1040 - 1080 and Sana'a in 1062. He ruled Dhu Jibla 1080 - 1086 and Aden 1084-1086. Period of anarchy, 1110-1138, during which al-Masud's and Zuray's sons (Abu 'l Su'ud ibn Zuray', Abu 'l Gharat ibn al-Mas'ud, Saba' ibn Abi 'l-Su'ud, Muhammad, and 'Ali ibn Muhammad) wage war against one another. Below is more details of the rulers on two main Castles. Full name: al-Mahdi-li-din Allah Ahmad al-Muti ibn al-Husayn ibn Ahmad. Full name: al-Mutawakkil ala Allah Salahaddin al-Mutahhar b. Izzaddín Muhammad b. Samsaddín. TAHIRID at al-Miqrana and Juban. Five further Tahirid princes continued to rule in remote fortresses. The first of the five was Ahmad ibn Amir; The last one, Amir III ibn Daoud, was executed by the Ottomans in 1538. He was also known as Sahib al-Mawahib. Full name: al-Nasir li-Dín Allah al-Mahdi Abdullah ibn al-Hasan ibn Ahmad ibn al-Abbas. Full name: al-Mutawakkil ala Allah Muzaffar ad-Din Muhammad ibn Yahya ibn Ali ibn al-Abbas. Full Name: al-Hadi li-Din Allah Sarafaddin ibn Muhammad ibn Abd ar-Rahman. Full Name: al-Mutawakkil ala Allah Seif ul-Islam Yahya ibn Muhammad Hamid ad-Din. SA#1141 Silver Dirham. Year: AH 1109-1130 (1697 - 1718). Weight: 1.55 g [2.00 - 3.00g]. Metal: Silver. Diameter: 19.00 mm. Edge: Plain. Alignment: Rotated. Mint: Sana'a. Obverse: N/A. Reverse: N/A. Mintage: N/A. Mintage Years: AH 1109-1130 (1697 - 1718). Ruler: al-Abbas I al-Mahdi ibn Mansur [AH 1161-1189 = 1748-1775]. Note: Scarce type. Note: Silver coins of his reign were struck mainly at Sana'a, but the mint name is frequently omitted. There are several smaller denominations, but they are have not yet been definitively identified. The ruler used his name as "al-Nasir Muhammad" during AH1098-1105 (1687-1693AD), "al-Hadi Muhammad" during AH1105-1109 (1693-1697AD) and "al-Madhi Muhammad" during AH1109-1130 (1697-1718AD). According to Stephen Album, "Yemen coins are the most unappreciated coins on the face of the planet". The Hashemite Mutawakkilite Kingdom (Arabic: المملكة المتوكلية الهاشمية‎‎ al-Mamlakah al-Mutawakkilīyah Al-Hashimiyah), also known as the Kingdom of Yemen or, retrospectively, as North Yemen, was a state that existed between 1918 and 1962 in the northern part of what is now Yemen. Its capital was Sana'a until 1948, then Taiz. Full name: an-Nasir li-Dín Allah Ahmad ash-Shams ibn Yahya Hamídaddín. Full name: al-Mutawakkil ala Allah Abd Allah ibn Yahya Hamidaddin. In 1955 a coup by a group of officers and two of Ahmad's brothers was crushed. In April 1956 Ahmad bin Yahya signed a mutual defense pact with Egypt, involving a unified military command. He died on 18th September 1962 in Taiz, buried Sana'a. Full name: al-Mansur bi-Allah Muhammad al-Badr ibn Ahmad. On 26th September 1962, Abdullah as-Sallal, whom al-Badr had appointed commander of the royal guard, staged a coup, and declared himself president of the Yemen Arab Republic. Al-Badr continuing in rebellion to Mar 1970 (from 1967 at-Ta'if, Saudi Arabia exile). War between Royalist (backed by Saudi Arabia) and Republican (backed by Egypt) factions 1962-1970. Head of the Royal House of Yemen, born 1926. He did not abdicate and did not renounce his claims and titles, married three times, and had two sons and two daughters. He died 6th August 1996 in London, buried at Brookwood Cemetary in Woking, Surrey. Kathiri State of Seiyun (includes: coins issued at Tarim, Seiyun and al-Ghurfah). 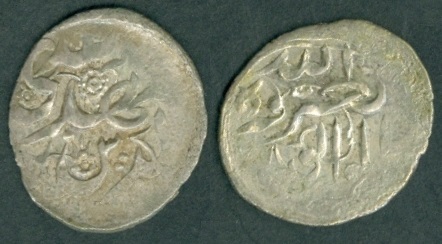 Sultanate of Qu'aiti (includes: Mukalla and counterstamped coins issued at Shibam). He was President of Arab Republic of Yemen from 18 Jul 1978 to 22 May 1990 and continued as unified Yemen President. In December 2017, he declared withdrawal from the coalition with the Houthis and instead sided with his former enemies – Saudi Arabia, the United Arab Emirates and president Hadi. However, accused of treason, he was killed by a Houthi sniper, while attempting to flee the capital city of Sana'a amidst the battle on 04 December 2017. Continues in opposition at Aden 21 Feb - 25 Mar and 22 Sep - Oct 2015; in Saudi Arabia exile 26 Mar - 22 Sep 2015 and since Oct 2015; retains international recognition as President of Yemen. On 15 October 2018, Hadi dismisses Ahmad Obaid Bin Daghr and appoints Maeen Abdul Malik as prime minister, who sworn in 18 October 2018. On 07 November 2018, Hadi appoints Lt.Gen. Mohamed al-Maqdishi as defense minister. He is killed in an airstrike; this is announced on 23 April, with Mahdi al-Mashat named as successor (sworn in 25 April). He is a Yemeni political figure from the Houthi movement. The Supreme Political Council extends the presidency of Mahdi al-Mashat to 24 August 2019. Republic of Yemen Currency: Rial = 100 fils. 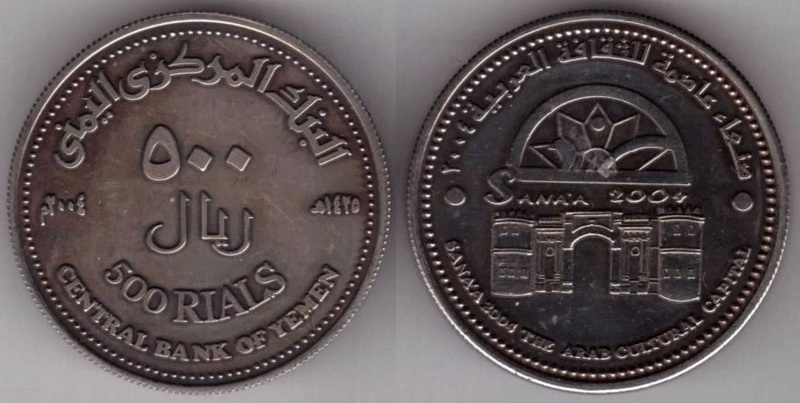 In 1993, the first coins were issued for the Republic of Yemen. The value of rial against the United States dollar dropped significantly compared to 12.01 rials per dollar in early 1990s. 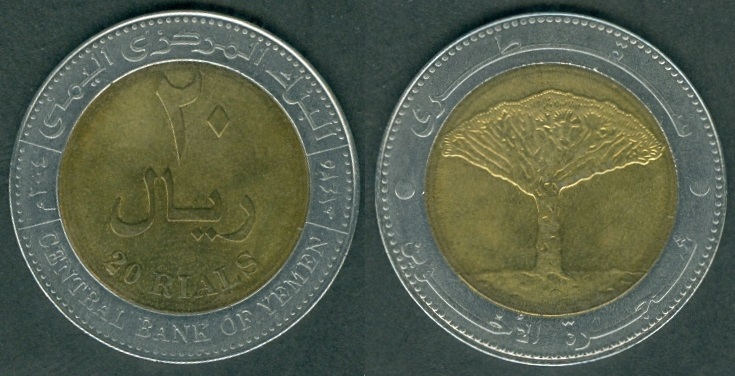 Since the mid-1990s the Yemeni rial has been freely convertible. Though it dropped from YER 20 to approximately YER 215 against the U.S. dollar since then, the rial has been stable for several years. However, since 2010 the Central Bank had to intervene several times, resulting in a serious decline of foreign reserves. By late 2013, the Economic Intelligence Unit expects reserves to decline to approximately 1.3 months of imports over the following years, despite information that Saudi Arabia would transfer $1 billion to the Yemeni Central Bank. When Yemen unified, coins had been issued in North Yemen in denominations of 1, 5, 10, 25 and 50 fils and 1 rial. The fils denominations have all disappeared from circulation. 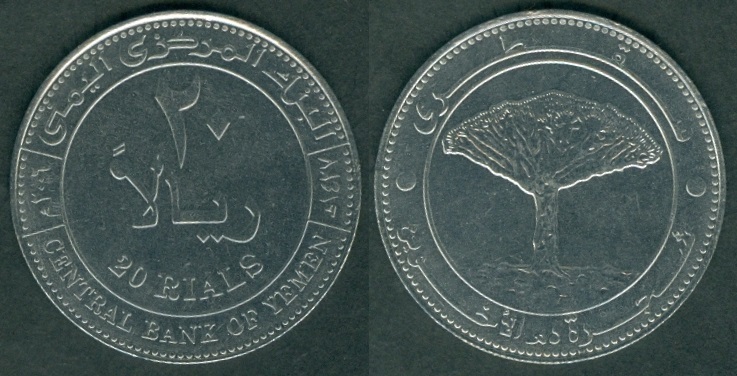 In 1993, new coins were introduced by the Central Bank of Yemen in denominations of 1 and 5 rials. 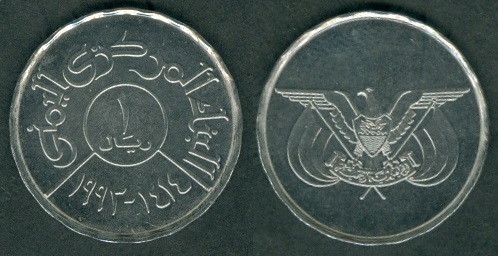 These were followed by 10 rials coins in 1995 and 20 rials in 2004. KM#25 One Rial. Year: AH1414 - 1993. Weight: 2.68 g. Metal: Stainless Steel. Diameter: 20-sided; 20.00 mm. Edge: Reeded. Alignment: Medal. Mint: Monnaie de Paris, Pessac. 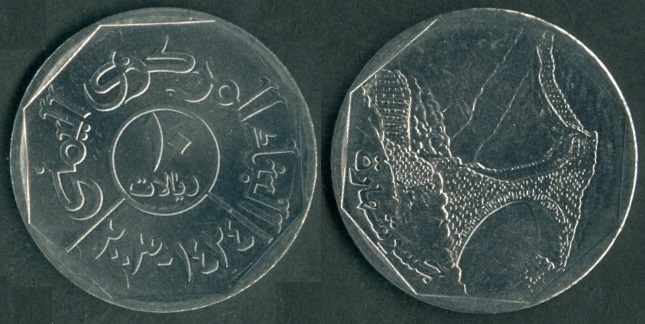 Obverse: "البنك المركزى اليمنى" (Central bank of Yemen) written at the top section. Value "١" (1) with "ريال" (Rial) written within the center circle. Date "١٩٩٣-١٤١٤" (1993-1414) written at the bottom. 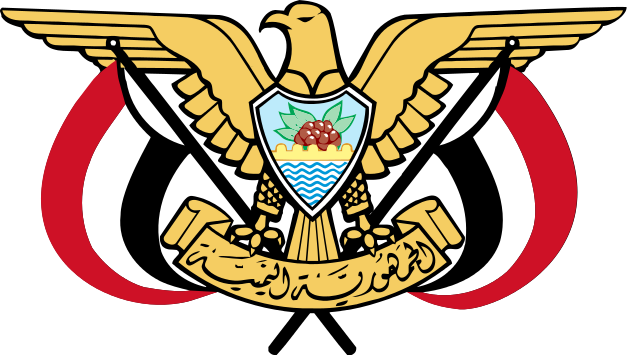 Reverse: "الجمهورية اليمنية" (Republic of Yemen) emblem in the center. Mintage: N/A. Mintage Years: One year type. KM#26 5 Rials. Year: AH1414 - 1993. Weight: 4.39 g. Metal: Stainless Steel. Diameter: 22-sided; 23.00 mm. Edge: Reeded. Alignment: Medal. Mint: Monnaie de Paris, Pessac. 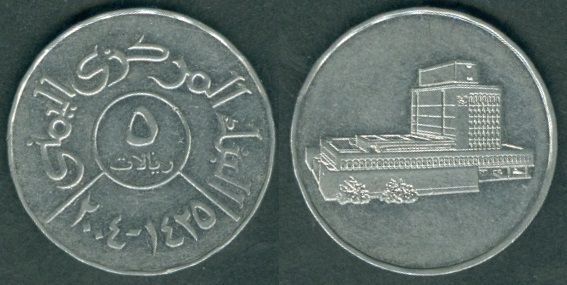 Obverse: "البنك المركزى اليمنى" (Central bank of Yemen) written at the top section. Value "٥" (5) with "ريالات" (Rials) written within the center circle. Date "١٩٩٣-١٤١٤" (1993-1414) written at the bottom. Reverse: Central Bank of Yemen building in the center. Mintage: N/A. Mintage Years: AH 1414 (1993), AH 1420 (2000), AH 1421 (2001) and AH 1425 (2004). KM#27 10 Rials. Year: AH1416 - 1995. Weight: 6.02 g. Metal: Stainless Steel. Diameter: 26.00 mm. Edge: Flatly reeded. Alignment: Medal. Mint: Monnaie de Paris, Pessac. 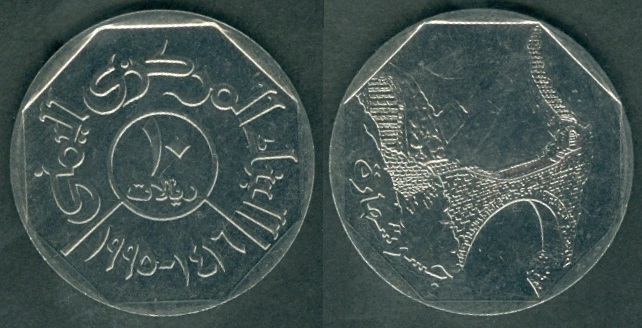 Obverse: "البنك المركزى اليمنى" (Central bank of Yemen) written at the top section. 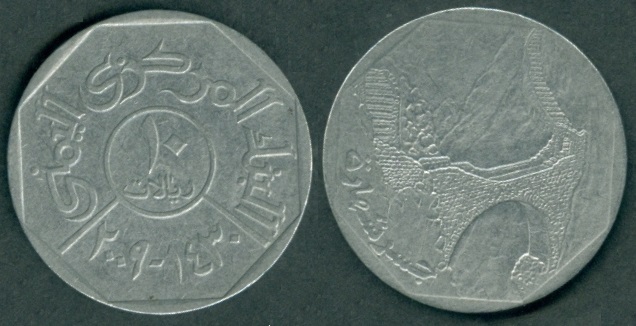 Value "١٠" (10) with "ريالات" (Rials) written within the center circle. Date "١٩٩٥-١٤١٦" (1995-1416) written at the bottom. Reverse: Central Bank of Yemen building in the center. Mintage: N/A. Mintage Years: AH 1416 (1995), AH 1424 (2003) and AH 1430 (2009). Year: AH1420 - 2000. Weight: 4.50 g.
Year: AH1421 - 2001. Weight: 4.40 g.
Year: AH1424 - 2003. Weight: 6.11 g.
Year: AH1425 - 2004. Weight: 4.48 g.
KM#29 20 Rials. Year: AH1425 - 2004. Weight: 7.05 g. Metal: Bi-Metallic; Brass plated Steel in center and Stainless Steel ring. Diameter: 29.85 mm. Edge: Reeded. Alignment: Medal. Mint: Monnaie de Paris, Pessac. 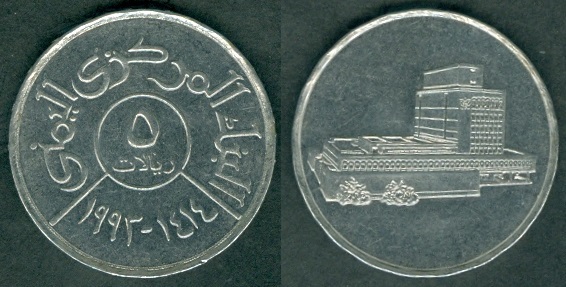 Obverse: "البنك المركزى اليمنى" (Central bank of Yemen) written in Arabic at the top section. Value "٢٠" (20) with "ريال" (Rial) and "20 RIALS" written within the center circle. Date "٢٠٠٤" (2004) written at the left side and "١٤٢٥" (1425) written at the right side. "CENTRAL BANK OF YEMEN" written at the bottom section. Reverse: "سقطرى" (Socotra) written in Arabic at the top section. Socotra Island Brothers Tree in the center circle. Large dot on both sides. "شجرة الاخوين" (Brothers Tree) written in Arabic at the bottom section. Mintage: N/A. Mintage Years: One year type. KM#30 500 Rials. Year: AH1425 - 2004. Weight: 21.00 g. Metal: Copper-Nickel-Zinc - Silver Plated. Diameter: 35.00 mm. Edge: Reeded. Alignment: Medal. Mint: Damascus, Syria. 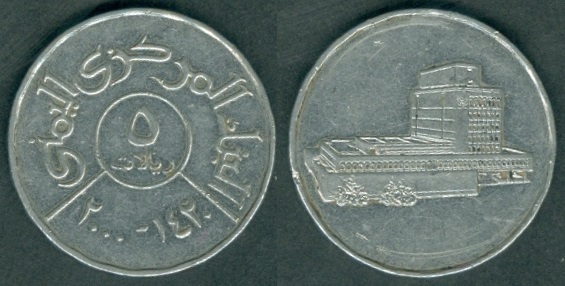 Obverse: "البنك المركزى اليمنى" (Central bank of Yemen) written in Arabic at the top section. Value "٥٠٠" (500) with "ريال" (Rial) and "500 RIALS" written within the center. Date "٢٠٠٤" (2004) written at the left side and "١٤٢٥" (1425) written at the right side. "CENTRAL BANK OF YEMEN" written at the bottom section. Reverse: "سنعاء عاصمة الثقافة العربية ٢٠٠٤" (Sana'a capital of Arab culture 2004) written in Arabic at the top section. Sana'a 2004 logo in the center. Large dot on both sides. "SANA'A 2004 THE ARAB CULTURE CAPITAL" written at the bottom section. Mintage: N/A. Mintage Years: One year type. Note: KM#31 exists as 1000 Rial in Brass - Silver Plated of weight 70.00 g and diameter: 60.00 mm. KM#29a 20 Rials. Year: AH1427 - 2006. Weight: 6.75 g. Metal: Stainless Steel. Diameter: 30.00 mm. Edge: Reeded. Alignment: Medal. Mint: Monnaie de Paris, Pessac. 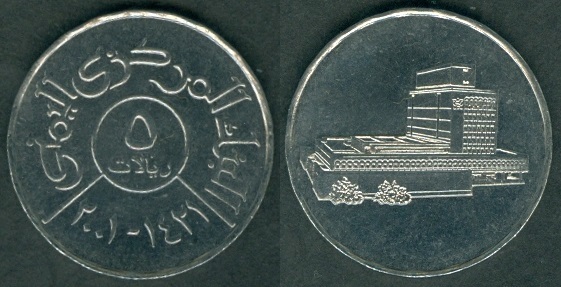 Obverse: "البنك المركزى اليمنى" (Central bank of Yemen) written in Arabic at the top section. Value "٢٠" (20) with "ريال" (Rial) and "20 RIALS" written within the center circle. Date "٢٠٠٦" (2006) written at the left side and "١٤٢٧" (1427) written at the right side. "CENTRAL BANK OF YEMEN" written at the bottom section. Reverse: "سقطرى" (Socotra) written in Arabic at the top section. Socotra Island Brothers Tree in the center circle. Large dot on both sides. "شجرة دم الأخوين" (Blood Brothers Tree) written in Arabic at the bottom section. Mintage: N/A. Mintage Years: One year type. Year: AH1430 - 2009. Weight: 6.09 g.
Irresistible comments: In the end, I would first thank JOCHEN RENGER from Germany. He came to Riyadh, Saudi Arabia and insisted to met me. I redundantly decided to see him on 27th Aug 2013. During our conversation, he suddenly started to give a very valuable 30 minutes session on various varieties in Mutawakkilite Kingdom (Imam Yahya and Imam Ahmad) on Yemen coins. I was impressed to hear about such varieties and also got surprised that Krause publication has not listed such types. Mr. Renger established and contacted Sultan Ghalib II bin Awadh al-Qu'aiti and thus confirmed the existence of authentic counterstamps on Yemen coins. Based on his information, I started my hunt on various varieties. I tried to get hold of coin dealers and colleagues from Yemen but got much avail. Luckily from Ebay, I met HEMENDU VRAJLAL DESAI from Rajkot, India in April 2016. His father was living in Yemen and brought many kilos of copper and small silver Yemen coins back to India in 1965. These coins were in his father's bank vaults till 2003. These coins were discovered after his father's death. Mr. Hemendu is now selling these coins on Ebay. I requested him to send the scans of various 1/80 Riyal copper coins (AH 1350-1381), 1/10 Silver Riyal 5-sided coins for various date types (AH 1371-1380) and 1/40 Riyal torch types (AH 1382-1384). Mr. Hemendu saw my keen interest and took time from his busy schedule in scanning around 450 coins for two months and arranging them in his room every weekend. I use to study these scans and select the coins I wanted for my collection. I really appreciate and thank him for his time and helping me to find these varieties. Finally after 2.5 years of my hunt on Yemen coins, I have decided to added and share these varieties in December 2016 on my Yemen webpages as information/knowledge to coin collectors.